Rachael Blackmore booted home her first Cheltenham Festival winner as A Plus Tard streaked clear in the Close Brothers Novices' Handicap Chase. 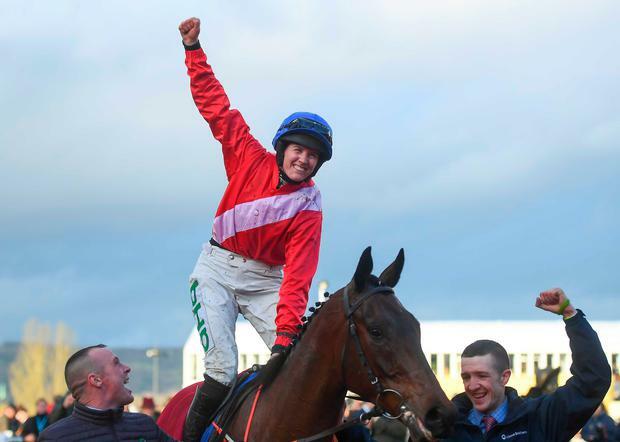 Carrying the famous colours of Cheveley Park Stud, Blackmore appeared to have strong claims of breaking her Festival duck aboard the Henry de Bromhead-trained A Plus Tard - who beat Arkle winner Duc Des Genievres on his penultimate start and was sent on his way at 5-1 for his handicap debut. His supporters will have had few concerns for the duration of the two-and-a-half-mile contest, as Blackmore's mount fenced fluently on the heels of the leaders before moving ominously to the lead racing down the hill. Joseph O'Brien's Tower Bridge was second, with Gordon Elliott's Ben Dundee rounding off an Irish one-two-three.